London’s newest museum attraction is greasy, smelly and a glimpse at the hidden underside of urban life. The Museum of London’s latest display is a chunk of a 130,000-kilogram fatberg that was blasted out of a city sewer last year. It took sewage workers with jet hoses nine weeks to dislodge the 250-metre-long mass of oil, fat, diapers and baby wipes from beneath Whitechapel in the city’s East End. The museum has lovingly preserved a chunk the size of a shoe-box, whose mottled consistency a curator likens to parmesan crossed with moon rock. Close examination reveals the presence of tiny flies. Three nested transparent boxes protect visitors from potentially deadly bacteria, and from the fatberg’s noxious smell. The museum is so confident of the item’s ick appeal that the exhibition — titled Fatberg! with an exclamation point —comes with a selection of merchandise including T-shirts and fatberg fudge. Sparkes considers the fatberg a natural for the museum, which charts the city’s ancient and modern history. The word itself, a hybrid of “fat” and “iceberg,” is one of London’s gifts to the world: It was coined by the city’s sewer workers and entered the Oxford English Dictionary in 2015. Fatbergs are a growing menace for cities around the world, but remain mysterious. 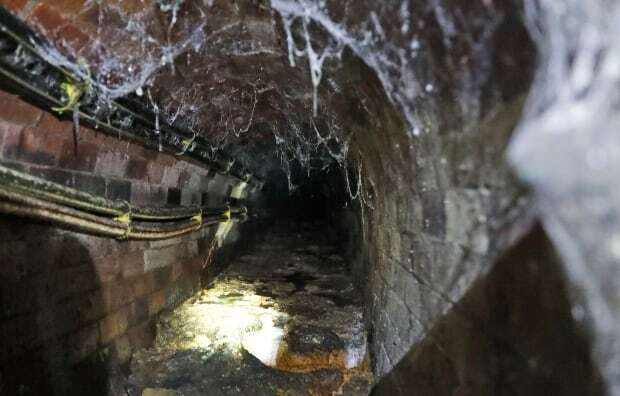 “Fatbergs aren’t really that well understood — how they form, how quickly they form and what they are,” said Sparkes. She said museum curators struggled to figure out how to preserve their volatile sample of the mass of detritus mixed with cooking fat, palm oil and oils found in products like hair conditioner and body lotion. They debated pickling, but “decided no, it would probably dissolve and turn into toxic sludge.” Freezing was also rejected. In the end, the sample was air dried. The first chunk to undergo the process crumbled, but a second attempt succeeded. The exhibition is a sobering look at the effects of daily waste, but it does contain some good news. Most of the Whitechapel fatberg was delivered to Argent Energy, a company that turns waste into biofuel. Some of the sludge that once choked the sewer system is now fuelling London’s red double-decker buses. The fatberg is on display from starting Friday until July 1. Admission is free.